Unlocking only, I will ship my ECU. As one of the pioneers in the BMW M2 ECU tuning we are pleased to offer our customers one of the most well tested ecu tuning for the F87 community. This tune is intended for customers who want to keep the stock characteristic while adding additional power making it even more fun to drive. Customers who have aftermarket axle back may take advantage of deleting the cold start for a more civil vehicle start-up and happier neighbors. The boost has been slightly increased and fine tuned to allow the car to be more agile based on the different stages. The tune is offered in-house or at any of our selected dealers. Customer interested in ECU tuning for upgraded turbo applications please contact us for specific pricing. We also offer in-house dyno tuning on your preferred piggyback unit ask our sales representative for details. Requires Down-pipe, Inter-cooler, Upgraded fuel system. Additional international shipping rates will apply. Please review click here to view the installation instructions. 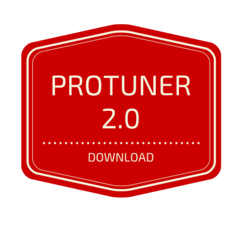 You will need to download the ProTuner 2.0 once you have received your cable.